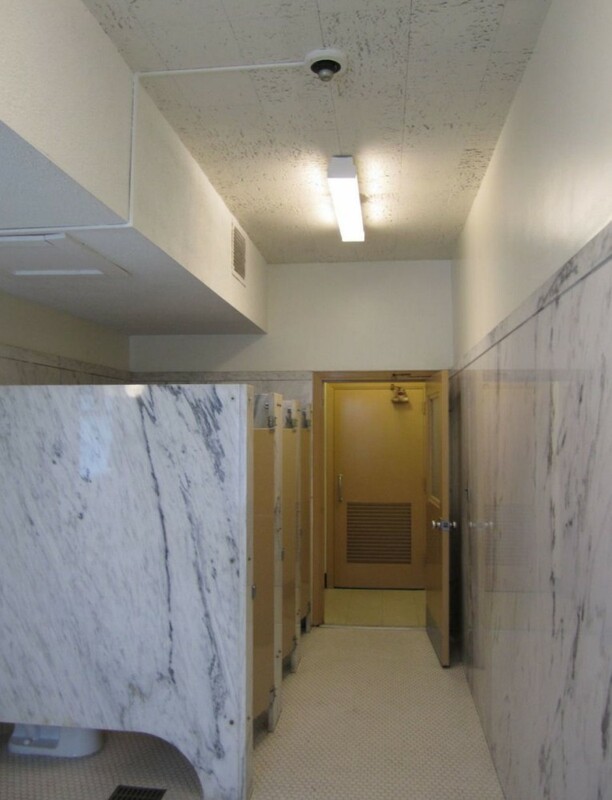 The 2010 Americans with Disabilities Act (ADA) Standards for Accessible Design went into effect in March 2012, but there are several requirements that continue to surprise architects and specifiers. automatic operators on doors that do not provide proper egress-side maneuvering clearance for a manual door must have standby power. A change submitted for the next edition of International Code Council (ICC) A117.1, Accessible and Usable Buildings and Facilities, would limit rotational force to 3 N-m (28 inch-pounds), and operation by a pushing/pulling motion to 66 N (15 lb). Some of these issues are specific to the 2010 ADA, while others are also addressed by International Code Council (ICC) A117.1, Accessible and Usable Buildings and Facilities. This standard is referenced by the International Building Code (IBC), International Fire Code (IFC), and National Fire Protection Association (NFPA) 101, Life Safety Code, for doors on an accessible route. An editorial change was made to the 2010 ADA to limit the operable force for door hardware to 22.2 N (5 lb). Editorial changes are normally used to address errors or make clarifications that do not affect the scope or application of the code requirements. These changes do not go through the normal code development process (i.e. committee hearings and opportunities for public comment). In other words, this change was unexpected. a shape that is easy to grasp, and does not require tight grasping, tight pinching, or twisting of the wrist to operate. This is the same language currently included in A117.1. No force limitation was mentioned with regard to the operation of hardware. A low-energy automatic operator must be actuated by a knowing act (e.g. this wall-mounted push button), or must comply with the requirements of a Builders Hardware Manufacturers Association (BHMA) standard. By referencing Paragraph 309.4, a limit for the operable force of hardware was established. This change created conflicts with other codes and standards, and even within the 2010 ADA standards. 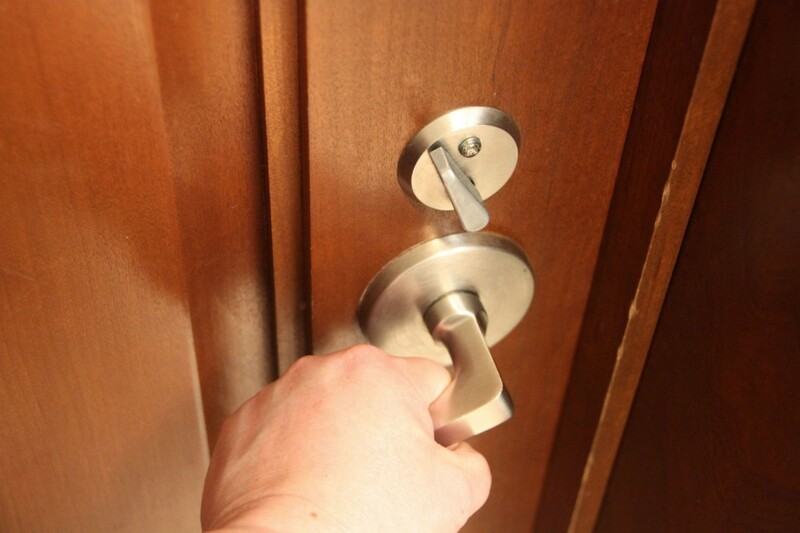 For example, in ADA, Section 404.2.9 addresses door and gate opening force—the force required to physically open the door. This section states the 22.2-N (5-lb) limit on opening force does not apply to the force required to release the latchbolts. This implies the allowable force required to release latchbolts could be greater than the 22.2-N (5-lb) opening force. The U.S. Access Board unofficially acknowledged there was a conflict between the opening force section and the operable force required by reference, but to date the standards have not been modified. Another conflict lies with IBC, IFC, and NFPA 101, for which panic hardware is required to operate with a maximum of 66 N (15 lb) of force to release the latch. In an attempt to establish a level of operable force aligned with other codes and standards, a change proposal was submitted for the 2015 edition of ICC A117.1. If approved, the proposal would establish a limit of 66 N (15 lb) maximum for hardware operated by a forward, pushing, or pulling motion, and 3 N-m (28 inch-pounds) maximum for hardware operated by a rotational motion. Additionally, the 2013 California Building Code (CBC) includes language virtually identical to the 2010 ADA operable force requirements, and requires hardware to operate with 22.2 N (5 lb) of force, maximum. However, the code contains conflicting language in Section 1008.1.10–Panic and Fire Exit Hardware, which requires panic hardware to operate with a maximum of 66 N (15 lb) of force. Given the change to CBC and the delay in addressing the conflict within the 2010 ADA standards, there are projects where the 22.2-N (5-lb) limit is being enforced for both lever-operated and panic hardware. For each project, a decision must be made regarding whether to use hardware meeting the requirements of IBC (and its referenced standard, ICC A117.1), or whether to specify hardware that meets the 22.2-N limit to avoid a conflict with ADA standards. If a motion sensor is used to actuate a door with an automatic operator, then guide rails and safety sensors are typically required. Full-power operators are typically found on high-use openings like the entrance to a grocery store or department store. These operators are not subject to the same restrictions on speed and force, and safety sensors or control mats and guide rails are required to prevent the doors from opening if someone is in the path of the door swing. Full-power operators must comply with ANSI/BHMA A156.10, Standard for Power-operated Pedestrian Doors. an access control device like a card reader, keypad, or keyswitch. at an installation height of 864 mm (34 in.) minimum and 1219 mm (48 in.) maximum above the floor. 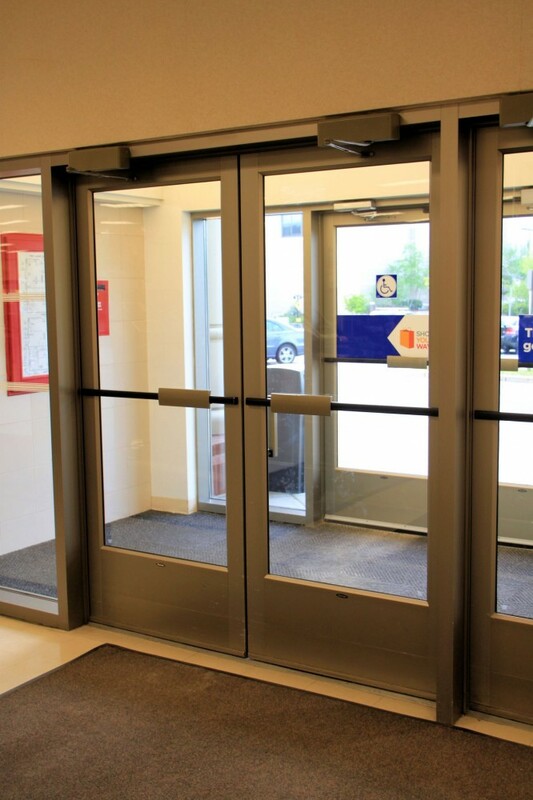 The 2010 ADA and ICC A117.1 contain requirements pertaining to the actuators for automatic doors in addition to what is included in the referenced standard. Clear floor space for a wheelchair must be provided adjacent to the actuator, and beyond the arc of the door swing. The mounting height is variable, depending on the reach range associated with the switch location. However, the range recommended by ANSI/BHMA standards is acceptable for most applications. Actuators must not require tight grasping, pinching, or twisting of the wrist to operate, and the operating force is limited to 22.2 N (5 lb) maximum. This door lacks proper maneuvering clearance on the egress side. If an automatic operator were to be installed to overcome this issue, the 2010 ADA requires standby power for the operator. Stepping into the field of a motion sensor is not considered a knowing act. If automatic operation via a motion sensor is desired, automatic doors must comply with the standard for full power operators—ANSI/BHMA A156.10, instead of A156.19. This means even though the door may have a low-energy operator, it has to meet the same requirements as a full-power operator, including the safety sensors or control mats and guide rails. Typically 762 mm (30 in.) high, guide rails are required on the swing side of each door. For some locations, the need for guide rails may mean motion sensor operation is not feasible. When certain criteria are met, walls may be used in place of guide rails. When doors are installed across a corridor, guide rails are not required if the distance between the wall and the door in the 90-degree open position does not exceed 254 mm (10 in.). The 2013 California Building Code requires two push-plate actuators at each actuator location—one mounted between 178 and 203 mm (7 and 8 in.) from the floor to the centerline, and the other mounted between 762 and 1118 mm (44 in.) above the floor. Vertical actuation bars may be used in lieu of two separate actuators, with the bottom of the bar at 127 mm (5 in.) maximum above the floor and the top at 889 mm (35 in.) minimum above the floor. Actuators must be in a conspicuous location, with a level and clear ground space outside of the door swing. The minimum size for push plates is 102 mm (4 in.) in diameter or 102 mm square, and the minimum operable portion for vertical actuation bars is 51 mm (2 in.) wide. Both types of actuators must display the International Symbol of Accessibility. While all these requirements have the same basic intent, it is best to check state and local codes to see which standard has been adopted, and what the specifics are in reference to actuators for automatic operators. It is important to verify the actuator type/quantity, location, and any additional requirements. Further, one must keep in mind additional safety features—including sensors and guide rails—may be required for low-energy operators actuated by a motion sensor. Some jurisdictions require actuators mounted in two positions, or a vertical bar actuator that will allow the door to be operated by a hand/arm or a crutch, cane, or wheelchair footrest. According to both accessibility standards and egress requirements, most doors have to provide at least 815 mm (32 in.) of clear opening width. (For pairs of doors, at least one leaf has to provide this.) The aforementioned Paragraph 404.3.1 states the required clear opening width must be provided “in power-on and power-off mode.” The clear opening’s full width is considered—for example, a 1.5-m (5-ft) pair of automatic doors would provide sufficient clear width even though neither leaf meets the minimum clear width for a manual door. 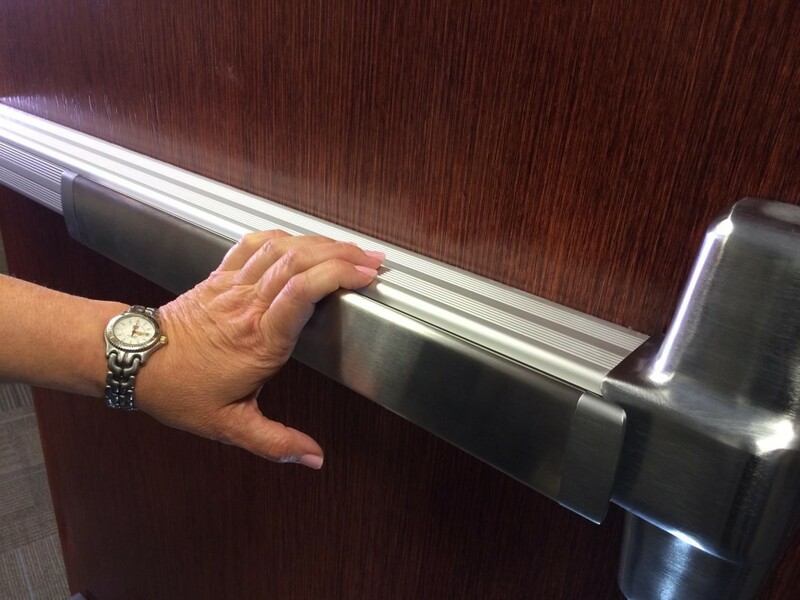 Maneuvering clearance for manual doors is addressed in Section 404.2.4 of the 2010 ADA. This section establishes the minimum space around the door needed by a wheelchair user to manually operate the door. The previously cited Paragraph 404.3.2 requires power-assisted doors and gates (manually operated but with reduced opening force) to have the same maneuvering clearance as manual doors. Automatic doors and gates serving an accessible means of egress without standby power would also need the required maneuvering clearance. Therefore, automatic doors and gates with standby power do not need the maneuvering clearance that would be required for a manual door. Manual doors on an accessible route must have a smooth surface on the push side with no protruding hardware within 254 mm (10 in.) of the floor or ground. In the photo at left, these components could inhibit passage through a door opening by catching a crutch, cane, walker, or wheelchair. 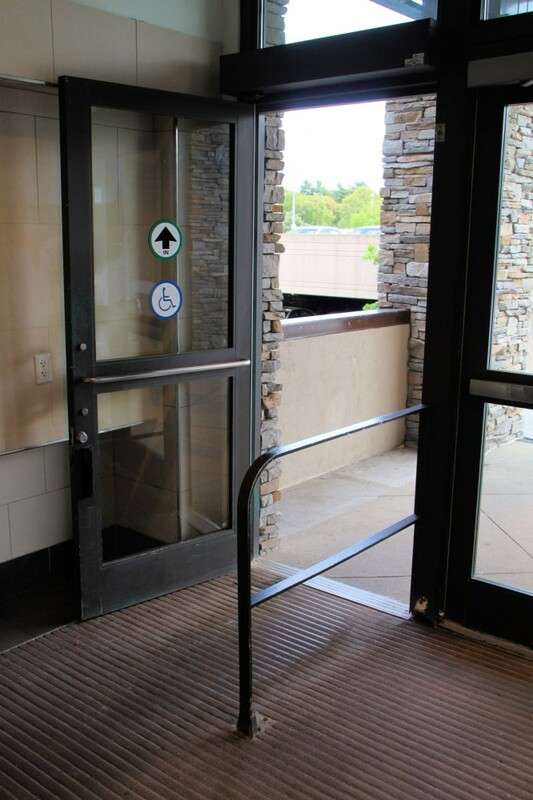 If an existing door serving an accessible means of egress does not have the required maneuvering clearance and an auto operator is added to overcome that problem, the operator needs to have standby power (unless the door stands open on power failure per the exception). This applies to doors part of a means of egress that must be accessible in an emergency, and is intended to avoid entrapment of a person with a disability if there is a power failure. The standard does not include a requirement for how much standby power must be provided. It is important to keep in mind automatic operators on fire-rated doors are required to be deactivated upon fire alarm. Therefore, an automatic operator with standby power should not be used on a fire-rated door to overcome maneuvering clearance problems because it will not be functional when the fire alarm is sounding. The purpose is to avoid projections that could catch a cane, crutch, walker, or wheelchair and inhibit passage through the door opening, so the requirement applies to the push side of the door only. The 254-mm (10-in.) measurement is taken from the floor or ground to the top of the horizontal bottom rail, extending the full width of the door. Prior to the 2003 edition of A117.1, the required dimension was 305 mm (12 in.). The standards require the surface of swinging doors and gates within 254 mm (10 in.) of the finish floor or ground to have a smooth surface on the push side that extends the full width of the door or gate. Narrow bottom rails and protruding surface bolts, surface vertical rods, kick-down stops, and full-height door pulls installed on the push side of the door would not comply with this requirement for a 254-mm (10-in.) high smooth surface. Horizontal or vertical joints in this surface must be within 1.6 mm (1/16 in.) of the same plane. If a kick plate is added to a door with a narrow bottom rail to resolve this problem, the cavity between the kickplate and the glass or recessed panel must be capped. There are several exceptions to this requirement. Sliding doors are not required to comply. Tempered glass doors without stiles are not required to have a 254-mm (10-in.) bottom rail (if the top of the bottom rail tapers at 60 degrees minimum from the horizontal), but protruding hardware is not allowed in the 254-mm (10-in.) high area. Doors that do not extend to within 254 mm (10 in.) of the finish floor or ground are also exempt. 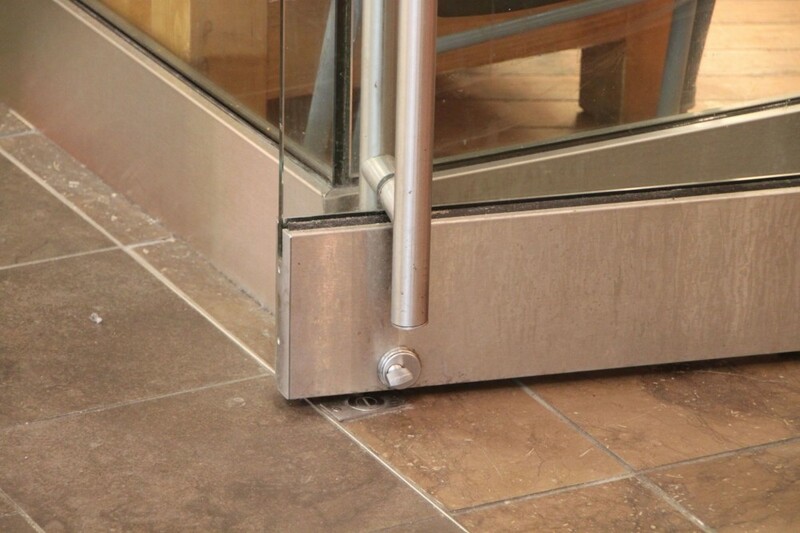 As outlined in ADA, existing doors are not required to provide the 254-mm smooth surface, but if kick plates are added to widen the bottom rail, the gap between the top of the plate and the glass must be capped. Existing doors are not addressed by A117.1, which is typically used for new applications as referenced by IBC. Now the standards are consistent, and increased awareness and enforcement of this requirement seem likely. With regard to these changes in the Americans with Disabilities Act standards, some accessibility requirements are not prescriptive and enforcement varies by jurisdiction. Therefore, it can be difficult to apply the standards, especially when conflicts exist. 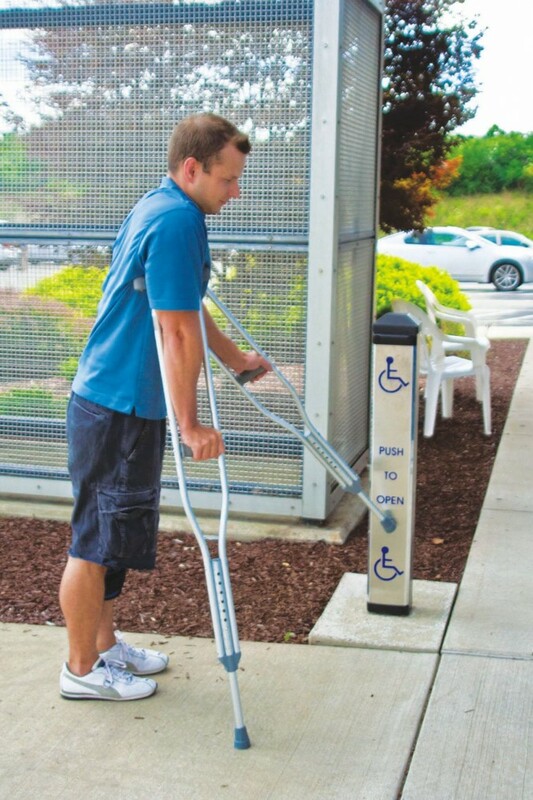 Additionally, some states have established their own accessibility standards. Following the most stringent requirements can help to avoid problems, and the local authority having jurisdiction (AHJ) can also provide assistance to determine what is required. Lori Greene, AHC/CDC, CCPR, FDAI, is the codes and resources manager for Allegion. She has been in the industry for more than 25 years, and used to be a hardware consultant writing specifications. Greene is a member of CSI, the Door and Hardware Institute (DHI), the International Code Council (ICC), the National Fire Protection Association (NFPA), and the Builders Hardware Manufacturers Association (BHMA) Codes and Government Affairs Committee. She has a monthly column on code issues in Doors & Hardware, and blogs at www.iDigHardware.com (or www.iHateHardware.com). Greene can be contacted via e-mail at lori.greene@allegion.com.